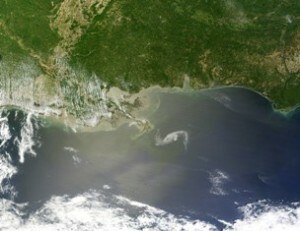 NASA satellite view of the Louisiana coastline showing the oil spill creeping toward the Mississippi Delta. The ocean ecosystems and fishing communities in the Gulf of Mexico face potentially catastrophic impacts as a result of the 5,000 barrels of oil a day spewing out of the sub-seabed and into the waters off the coast of Louisiana. Oil moving throughout vast expanses of Gulf waters and ocean habitat and coming ashore on the massive Gulf Coast wetlands directly threatens not just the reef fish, oysters, crabs and shrimp that actually live there, but also many other species that use the reefs, marshes and other wetlands as nurseries, or that depend upon them for prey which lives or develops there. The beaches that are likely to be coated with oil also provide important feeding grounds for shorebirds and fish alike, and essential nesting areas for sea turtles. In addition, a large number of ocean species release larvae to drift with the currents in near-surface waters — exactly where the oil currently is — in their most vulnerable life stages. Together, a huge fraction of the fish production in the region is at risk – a body blow both to marine ecosystems and the multi-billion dollar coastal industries tied to commercial fishing and seafood, and sport fisheries and recreation. It is especially sad that this catastrophe threatens the fishing communities of the Gulf that have become national leaders in transforming oceans fisheries to models of sustainability. EDF calls on the federal government to act swiftly to minimize preventable damage, but also with compassion to bring aid and assistance to already-reeling coastal communities.